Flekken moved to Alemannia Aachen in 2009 when he was only 16 years old. In the 2012-13 season he was the goalkeeper of the second team, but in January 2013 he became the first goalkeeper because of an injury of the other goalkeeper. 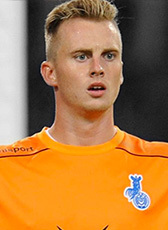 Flekken moved to Greuter Fürth in the summer of 2013, where he is the third goalkeeper. He is a regular starter in the second team of Greuter Fürth, that competes in the Regionalliga. Flekken signed a 3-year contract for MSV Duisburg on 12 June 2016 for an undisclosed fee. MSV Duisburg was just relegated from the 2nd Bundesliga at the moment Flekken signed. In summer 2018 after two years as first choice in Duisburg, the Dutch goalkeeper moved to SC Freiburg on the highest tier on a 4-year deal.